Date/Time - 30 Oct (Monday), 7.45 p.m. – 9.30 p.m. Description - 2017 marks the 500th year since the Reformation led by Dr Martin Luther in 1517. 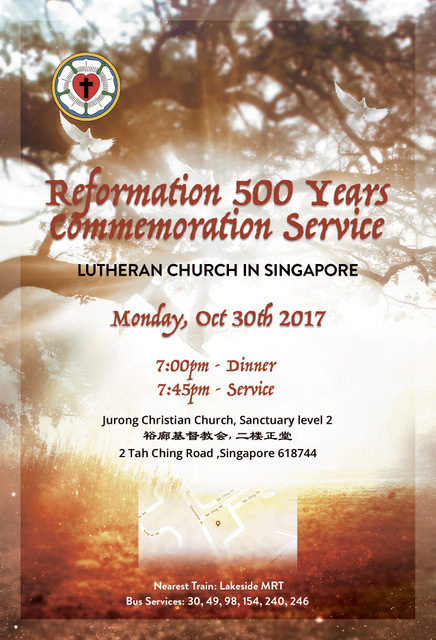 The Lutheran Church in Singapore will celebrate the 500th Anniversary of this historic event with a joint Worship Service with the Roman Catholic Diocese of Singapore. Led by Archbishop William Goh of the Roman Catholic and Bishop Terry Kee of the Lutheran Church in Singapore, the theme of the event is “From Conflict to Communion” - reflecting the desires of both churches for healing and reconciliation of the pains caused by the schism of the church during the Reformation. Organised by The Lutheran Church in Singapore.